Kathy has always loved animals as a kid and knew she wanted to work with animals no matter what. She graduated from the Medical Institute of Minnesota, with a degree as a Certified Veterinary Technician. 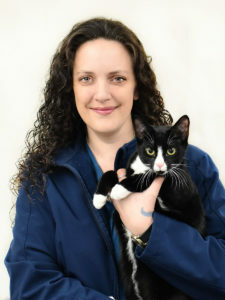 She has been a member of the Lakes Veterinary and Surgical Center team since 2003. Kathy loves working at a clinic where she can help with specialized surgeries and procedures. In addition to Kathy’s well-honed technical abilities, she is a member of the American Society of Veterinary Dental Technicians and a Hills Nutritional Advocate. Kathy is an extremely gentle, caring person. In her free time, Kathy can be found spending time with her husband, three kids and numerous animals. She enjoys riding her horses, hunting and spending time with her family.